When gas prices started to really hike northward about ten or fifteen years ago, consumers really didn’t know how to react. Many people had purchased their vehicles with little regard to fuel efficiency because at the turn of the century “fuel efficiency” wasn’t something on most buyers’ wish lists. Things have obviously changed, as today the first thing you see on a new car’s tag at the dealership is the gigantic MPG number in big bold letters. People care about how far they can push their gallons of gas because, frankly, those gallons of gas are much too valuable to be wasted. Thankfully, today’s auto world offers a lot of really nice, efficient cars that not only provide top-notch fuel economy, but also great looks, long lists of features and even strong-performing powertrains. Kelley Blue Book recently put out a list of their “10 Most Efficient Mainstream Sedans,” and we here at Pacific Honda were very pleased to see both the 2014 Honda Civic Hybrid and 2014 Honda Accord Hybrid make the list. 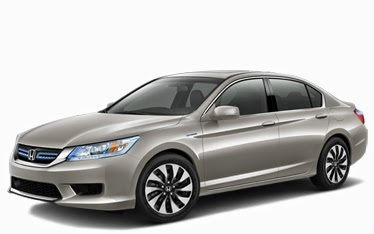 The Accord Hybrid actually was the top overall vehicle mentioned thanks to its class-leading efficiency, smooth drive, great features and dependability. The Civic, meanwhile, was recently given a hip refresh, so not only does it offer great efficiency with some excellent technological features, but it also looks and drives really well, too. Both vehicles offer Honda LaneWatch, a rearview camera, a Pandora audio interface and Bluetooth connectivity features that even read texts aloud while driving. We’ve been very pleased with both of these vehicles, and we were pretty excited to see that KBB.com was, too.